Update your home decor with these stunning acrylic photo blocks. Your new acrylic blocks are free-standing and weighty and make ideal gifts for loved ones or a fun treat for yourself. Available in four different sizes, the crystal clear, diamond polished finish of each block creates a distinct and stylish edge. Your photos are printed in high definition and a unique 3D appearance will make them stand out in a truly original and contemporary way. Design online and preview your creation before you order to ensure it looks just right. Once you're happy with them, complete your order and it'll be handmade fast with an express delivery option. Crystal clear free-standing acrylic prints have a 3D contemporary look that reflects the image around the sides and creates a wonderful photographic display. We print photos directly into the acrylic which then becomes, in essence, an acrylic photo frame. These acrylic photo prints can be displayed in the office, around the home or as a printed gift for someone special. Acrylic blocks have an attractive glassy look but are virtually unbreakable. A self-standing acrylic block is a unique gift which creates high visual impact. The transparent quality reflects and refracts light, bringing the picture to life. The reverse of your block has a matte white backing where your image is still visible so, please note, they're not fully transparent. 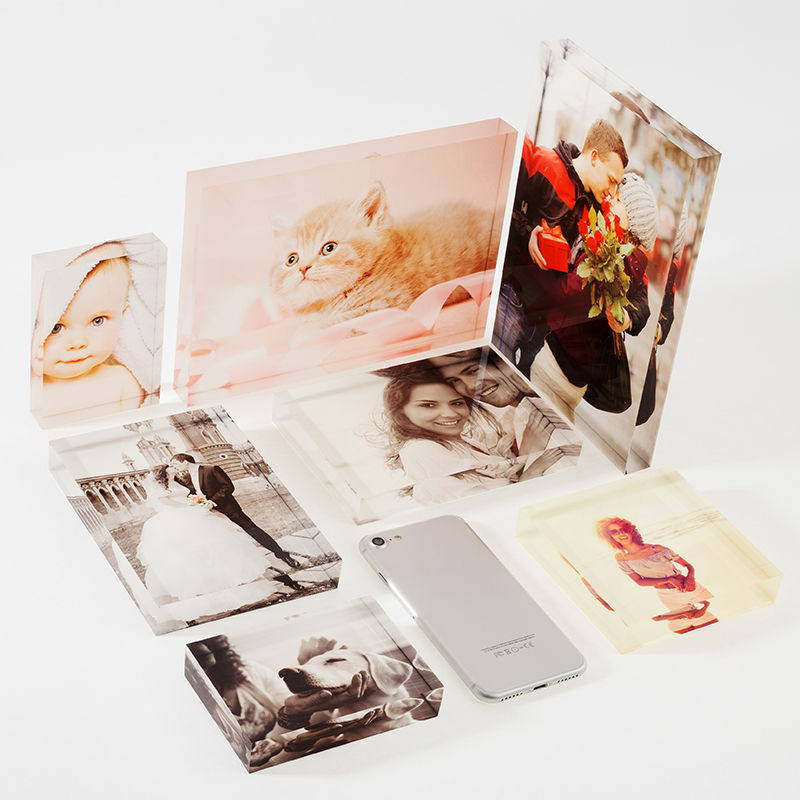 Turn your best photos into acrylic blocks with us. Our acrylic blocks are ideal for sending to your friends and family in the post. I’m so glad I went with this company for my acrylic photo blocks. The quality is faultless. Unreal quality. Great price. Super quick delivery. Highly recommend and will keep buying from here. The Acrylic photo blocks I have bought the last 2 times and are great gift ideas. I will be buying more very soon. Product was exactly as described. Service was so efficient and faultless. Good communication Would definitely use again. Your acrylic photo blocks are handmade to order in by our onsite team. Your photos are permanently printed into the acrylic, ensure that they will not rub off or fade, and will last for years to come. The expert craftsmanship of your new acrylic photo blocks allows every detail to shine through in exceptional high definition quality. Fine lines are reproduced with precision and colours are bold and vibrant. Each block is then polished to perfection and sent out to you in a matter of days. If you love the contemporary look, then these blocks are for you. They are a fun and fabulous way to display photos and prints. They also make heartfelt and stylish gifts. The different size options are perfect for creating a series. Design your very own family portrait by printing photos of the whole brood on various sizes of photo blocks - larger options for parents and smaller options for the children. You can then display these proudly on your fireplace, coffee table or anywhere you like. The free-standing design allows them to be showcased on any surface. Anyone who enjoys showing off their family, friends, and travels will be a big fan of these blocks. Because of their durable nature, they are great for children's rooms and nurseries, as you don't have to worry about them being knocked over and breaking. Why not create a family tree for your little ones, printing family faces onto the blocks and allowing them to display them as they wish in their bedroom? If you are looking for a unique way to print your wedding photos, then acrylic blocks will give them a fresh and contemporary edge. Take advantage of the four different sizes of blocks and create a display featuring the newlyweds, the wedding party, memorable details from the day, and even an intimate photo the first dance.